The continual growth in the significance of mass-mediated communication makes it essential that we are able to reflect upon and critically appreciate the semiotic processes that are involved in their impact upon social and cultural life. 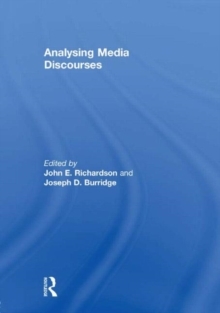 This edited collection showcases a range of diverse approaches to the analysis of various forms of mediated communications, including varying degrees of attention to their associated textual, discursive and social practices. Individual contributions are devoted to exploring, in analytical depth, multiple dimensions of each of the following media: newspaper articles, magazines (both historical advertising and contemporary editorial discourse), television (both situation comedy and "reality" TV programmes), books (covers and content in two genres), political leaflets, and a flight simulation computer game. The collection will be an important resource for scholars and students within disciplines including communication studies, sociology, media studies, cultural studies, discourse studies, and journalism studies. This book was published as a special issue of Social Semiotics.